Scandinavian interior designs are famed for their ultra-functional, airy, and stunningly simple decor. And don’t be thinking that this only involves Ikea, because it is so much more than that, although going to that popular furniture store helps a lot in designing your very own Scandinavian inspired home. Get some great ideas from this list below. Because Scandinavia has very little natural daylight, they believe in designing homes that let it as much light as possible. Mimic Scandinavian homes by keeping the windows free from heavy, fussy curtains or shutters. Scandinavian designs don’t necessarily mean stark, cold, white walls only, you can warm up the place by inserting some natural wood elements into your home. This also helps to make your home look more cosy. Nature and it’s lush greenery play a huge part in Scandinavian designs, which helps to inject some life into an otherwise bland room. And it’s a known fact that having more plants around the house produces more oxygen to keep you feeling refreshed. Furniture that is design the Scandinavian way will have clean, simple and fluid lines that is aesthetically pleasing. There’s no better example of great Scandinavian furniture than the classic Eames chair which is super versatile. To offset those often plain but classic furniture, Scandinavian homes mix it up with some soft furnishings to make a peaceful and relaxing haven that encourages snuggling. Soft throw pillows, fuzzy blankets and comfy covers transforms the place into a warm home. A vital part of our culture is to socialise and hang out with our friends and family, and one of the best ways to do that is by having a big dining table. This allows you to gather your social circle around you and have lots of fun, cheer and laughter. Contrary to popular belief, Scandinavian design isn’t all just monochromatic black, white and grey. In fact, you can make your home look more trendy and young by giving it some playful pops of colours while sticking to the Scandinavian style. Traditionally, white walls are an iconic part of Scandinavian homes, but you can break the rules by painting your walls grey too! After all, your home is meant to a place where you can express yourself as well. Who says your little ones’ rooms have to be bright, neon colours to be nice? Incorporate a Scandinavian theme into their room that is timeless and can be easily updated as they grow older, which saves you time and money when you want to redecorate. 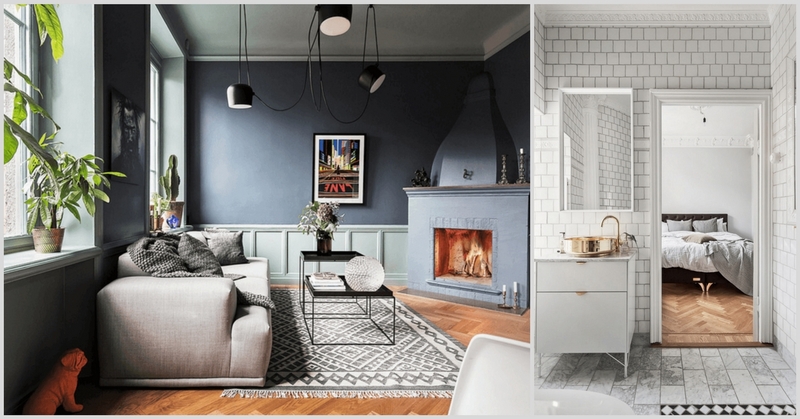 Scandinavian homes love to go with neutral colours that remain classy and stylish over the years, but if you are bored of that, you can use blue colours as well. It is a popular choice for many Scandinavian designs and really makes a difference to your home. Scandinavian styles are known to be refined and chic, so remember to decorate your bathroom as well. Sticking with the tried-and-trusted white palette is fine, but you might want to jazz it up with some marble tiles and copper coloured accents to make your bathroom look truly regal. Bet you’re surprised that dark coloured walls can work well with a Scandinavian theme as they usually incorporate white or light coloured walls. But pair them with a great amount of natural daylight flooding in and luxuriate in the stylish space you’ve created.